I am so happy to report that two of my favorite authors/resources have new cookbooks available. Check out Quick and Easy Meals from Mark Sisson (the Primal Blueprint guru) and you can pre-order Gluten-Free Cupcakes by Elana Amsterdam (the almond flour expert). New recipes – I can’t wait! Any of you who have been attending the Healthy Priority get-togethers, or have just been hanging around with me lately, know that I’ve been really excited about making grain-free/sugar-free (and therefore low carb) baked goods that are really tasty. Now, I am sure that people who are used to eating those small cakes that pass for muffins at your local grocery would be used to way more fat, sugar, and carbs. But for the rest of us who try very hard to feed our bodies foods that help and not hurt, having these muffins are a real treat! These two have been the favorite recipes so far. Both come from Elana Amsterdam’s fabulous cookbook called The Gluten-Free Almond Flour Cookbook. It’s been mentioned on this site lots of time because it has become somewhat of the gold standard for baking with almond flour. If you are interested in healthy, grain-free and low-carb baking, go buy her book! Both of these recipes have been used and changed a number of times already. These are the basic recipes, but try experimenting to make them your own. One change is that I sometimes have used melted butter instead of the grapeseed oil just for a bit of richness. 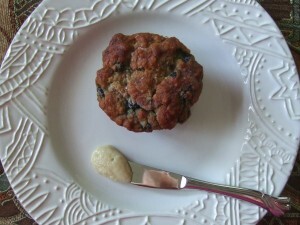 I’ve used dried cranberries instead of blueberries in the Banana Blueberry recipe, and I’ve only tried the Cinnamon Apple Muffins using unsweetened apple butter in place of the agave nectar in the original recipe. I might try applesauce next time, and maybe add some raisins? You get the idea – be creative! If you guys come up with some good variations, let me know in the comment section below so we can all share! And don’t forget – these muffins taste fabulous with a spread of nut butter on them. My favorite right now? Homemade Macadamia Nut Butter. Yum! Preheat oven to 350°. Line 12 muffin cups with paper liners. In a large bowl, combine the almond flour, salt, and baking soda. In a medium bowl, whisk together the grapeseed oil and eggs. Stir the wet ingredients into the almond flour mixture until thoroughly combined. Stir the bananas into the batter, then fold in the blueberries. Spoon the batter into the prepared muffin cups. Bake for 35-40 minutes, until the muffin tops are golden brown and a toothpick inserted into the center of a muffin comes out clean. Let the muffins cool in the pan for 30 minutes, then serve. Preheat the oven to 350°. Line 10-12 muffin cups with paper liners. In a large bowl, combine the almond flour, salt, baking soda, arrowroot powder, and cinnamon. In a medium bowl, whisk together the grapeseed oil, agave nectar, egg, and vanilla extract. Stir the wet ingredients into the almond flour mixture until thoroughly combined, then fold in the apples. Spoon the batter into the prepared muffin cups. Bake for 30-35 minutes, until the muffin tops are golden brown and a toothpick inserted into the center of a muffin comes out clean. Let the muffins cool in the pan for 30 minutes, then serve.